There are four brand-new stories, featuring Horrid Henry wreaking havoc on an airplane, being forced to write an essay about the Tudors, sabotaging the school play and sneaking on to a forbidden rollercoaster. Illustrated by Tony Ross, these timeless stories offer an irresistible introduction to reading for pleasure, featuring one of the best-loved characters in children’s fiction. Since it was first released in 1994, Horrid Henry has gone on to become an internationally bestselling phenomenon, with translations into 31 languages and over 21 million copies sold. Horrid Henry Up, Up and Away will be the 25th book in the series and contain the 100th Horrid Henry story – the perfect way to round off Henry’s gleeful, devil-may-care adventures! We’re thrilled to be bringing Francesca to Oswestry as part of the 25th birthday celebrations – don’t miss this opportunity to see and meet her! 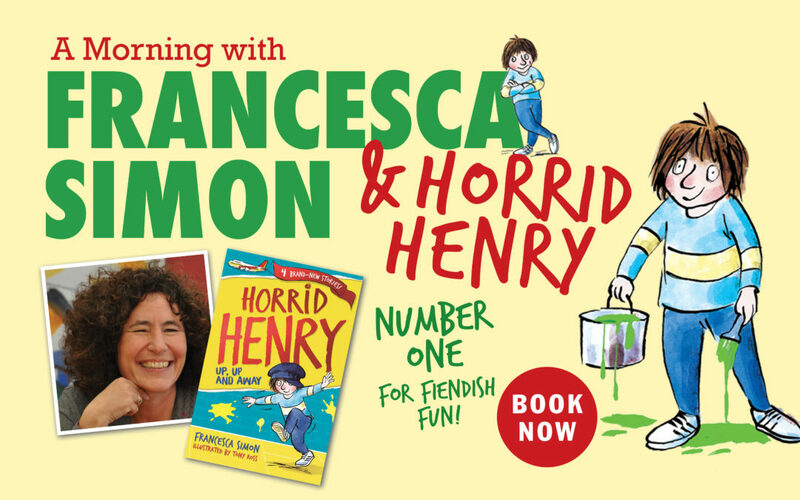 Horrid Henry himself will be making a guest appearance too!